In 2017, Dr. Jordan Peterson became one of the world's most popular public thinkers, after decades serving his clients as a clinical pysychologist and inspiring his students as a celebrated professor at Harvard and the University of Toronto. His YouTube lectures describing the deep connections between neuroscience, psychology and the oldest stories of humanity draw over a hundred million viewers from around the world, as do his firm but nuanced messages about personal responsibility and the meaning it bestows upon life. In a time of unprecedented change, when family structures are collapsing, education is degenerating into indoctrination, and political society is dangersously polarizing, 12 Rules for Life offers an antidote: the truth-some very ancient truth, applied to life's very modern problems. 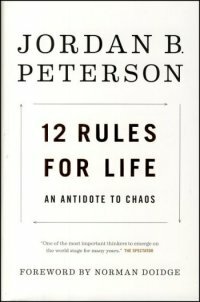 In this humorous, suprising, and informative book, Dr. Peterson tells us what we can learn from the nervous system of the lowly lobster about standing up straight (with shoulders back) and moving confidently through life; why you should never let your children do anything that makes you dislike them; why the ancient Egyptians so revered the capacity to pay attention that they worshipped it in the form of a god. Dr. Peterson discusses discipline, courage, and the necessity of clear, truthful thinking, distilling the discoveries of science and lessons from the great myths of the world into twevlve profound directives for living properly within the order and chaos of our lives. Join those who have already found inspiration and direction in Dr. Peterson's teachings. Discover in this book of exceptional power the simple yet profound rules for sorting yourself out, setting your house in order, and improving the world by first improving yourself.